Prince Edward’s Fries is an all-Canadian answer to that other famous French fry shop. 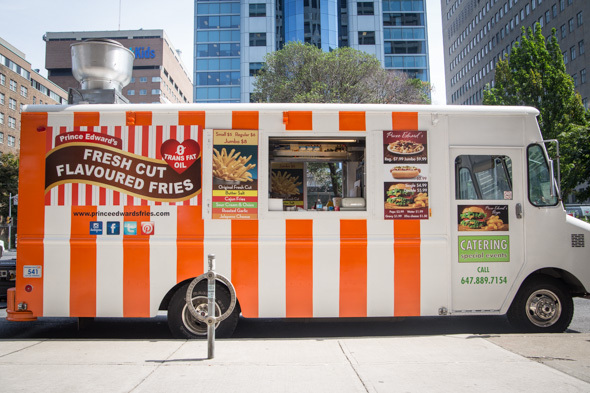 The brand-new spud shack on wheels specializes in big orders of equally outsized, golden-brown fries, made with potatoes from the truck’s namesake province and flavoured with a liberal dousing of house-made spice blends. Though they’ve only been on the road for a few weeks, owner Jay says he’s already getting phone calls in the middle of the night, asking where he’ll be serving up fries next. The fries in question are thick and square-cut, fried to a deep brown, with just the right mix of firmness and floppiness – the kind of chip-truck fries you want to just douse in malt vinegar. Thankfully, they have spray bottles of malt and white on hand, if that’s what you’re into. But the real flavour bomb comes from their spice mixes, which come in five flavours: butter salt (which makes your fries taste like popcorn), sour cream and onion, a respectably-spicy Cajun mix, jalapeno cheddar (a crowd favourite), and a slightly-sweet roasted garlic mix. “We realized ‘All the French fries are the same, and it gets boring.’ So I sat down one weekend with my wife, and we said ‘Let’s try flavour’. In addition to their spiced-up fries, they also do a monstrously huge poutine, done up traditionally with gravy and cheese curds, though they’re soon planning to bring in a Filipino spin on the dish. “We Filipinos are the third largest community in the city, and the fastest-growing language in the city. And we said, ‘We’re not doing anything with our food!’” Jay says. They’ll soon be remedying that with a poutine layered with beef afritada, made using a family recipe. “I hope it blows people’s minds away,” he adds. Hot dogs and burgers are also on the menu, and they’ll soon be bringing in a couple of salads, including a fruit-topped version, as a lighter option (after all, health food this ain’t). For now, though, the fries are obviously the biggest draw – and with Jay already full of stories about “best fries I’ve ever had” declarations and folks knocking on his truck’s window to demand when they’ll be open for business, they just might be on to something.